Burwood Shutters offers a quality range of intelligent automatic garage door openers that are slim and stylish in design. 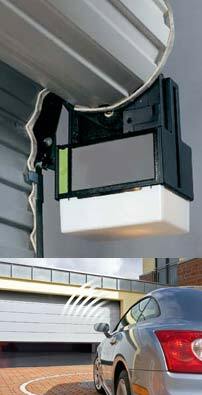 Imagine the convenience of automatically opening and closing your garage door from the comfort and safety of your car. No more getting in and out of your car to open or close your garage door during the rain and summer heat. Your garage door is automatically locked by the opener when closed. It cannot be opened until the automatic opener receives a coded signal from your remote control transmitter. The high security remote transmitters provided uses an advanced hopping code system to prevent others copying your code and gaining unauthorised entry to your home. Our openers are equipped with a string handle that can be used to easily open or close the door manually if power to the opener is disrupted for any reason. Operation is kept quiet and smooth with a "soft start" and "soft stop" feature which also prolongs the life of the motor. An inbuilt courtesy light comes on automatically whenever the door is activated.